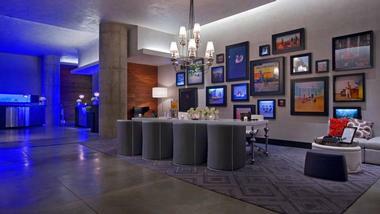 The 251 rooms at the W Austin Hotel are elegant and luxurious, offering guests a true home away from home. There are several room categories to choose from which include Cozy Rooms, Wonderful Rooms, Spectacular Rooms, Fabulous Rooms, Cool Corner Suites, Marvelous Suites, a Fantastic Suite, a WOW Suite, and an Extreme WOW Suite. Cozy Rooms are exactly that, cute and cozy. They are 287 square feet of space, including a bathroom featuring a Greek tub. The room has many music inspired accents from graphic prints to the guitar strap accent on the mirror. There is city views to catch a glimpse of the hustle and bustle below. Each Cozy Room has a queen size bed with 300 count thread luxurious bedding and goose-down comforters. Wonderful Rooms are between 323 and 424 square feet and are available with both pool and city views. Some of them have balconies overlooking the poolside. These rooms are available with either two queens or one king size bed. The king rooms feature an artistic looking red serpentine chaise lounge to not only add to the artsy-musical room but to provide a great lounging spot after a long day of exploring. 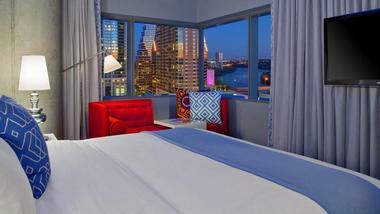 Spectacular Rooms are between 323 and 410 square feet with either city views or a view of Lady Bird Lake. They are available with either two queen size beds or a king, and in the king rooms guests will enjoy stretching out on the unique serpentine chaise lounge. Guests will love the private bathroom complete with Bliss Spa bath amenities. Fabulous Rooms are found in the corners of the hotel, which means they boast wrap around windows providing guests with amazing views of the Live Music Capital of the World. The custom zig-zag red and white patterned wallpaper adds to the artistic feel of the rooms, along with amazing photographs of Austin done by photographer, Scott Newton. These rooms also boast red serpentine couches for added comfort. These rooms are 407 square feet of contemporary space to enjoy. 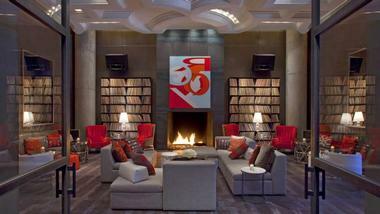 Cool Corner Suites are similar to Fabulous Rooms in that they are found on the corner positions of the hotel. Guests will find either city views, hill country or lake views from these suites with between 576 and 638 square feet of living space. They feature one bedroom with a television as well as a living room area with another TV. 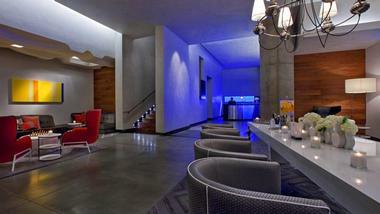 The exposed concrete walls add to the contemporary, industrial look of the suite. In the bathroom there is a separate tub and vanity for guests to enjoy. The Scott Newton photographs of many musicians performing in Austin are eye-catching as guests sit on the sofa and relax. The two Marvelous Suites are spacious with over 1300 square feet of comfortable square feet. There are two bedrooms and two bathrooms to offer guests who travel in groups but still want added privacy. There is a living room complete with sofa and slipper chairs to sprawl out. The dining area features a table with chairs for up to six diners to gather. Within each bedroom there is a television as well as a wall mounted flat screen in the living room for all to enjoy. The Fantastic Suite has over 800 square feet of space with living room area lit by a Twiggy lamp and offering a comfortable Molteni sofa and chair. The exposed concrete column gives guests a feel for the structure and making of the hotel. The bathroom boasts two sinks, and a separate Kohler bathtub. The WOW Suite is just about 1300 square feet of space offering guests two bedrooms on the southeast corner of the hotel. 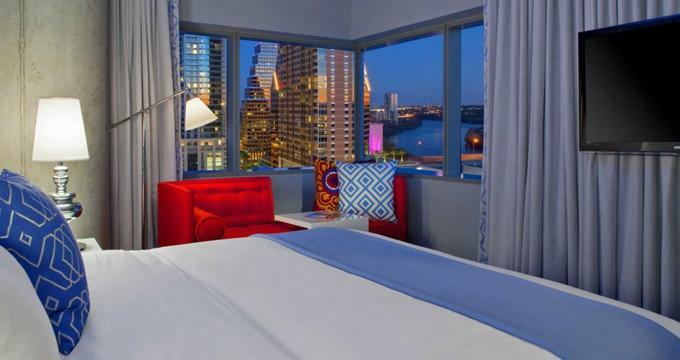 Guests will love the spectacular views from the wrap around windows of both the city and Lady Bird Lake. There is a custom made round dining table with seating for up to six people, and a living room complete with window alcove. The master bedroom features its own vanity area as well. Each bedroom has its own television but there another wall mounted TV in the living room area as well as a bar area. The Extreme WOW Suite boasts almost 1800 square feet of amazing space. The panoramic wrap around windows are a definite favorite of this room, featuring views of the city of Austin and beautiful Lady Bird Lake. This suite has both a wet bar and catering space for the ultimate in entertaining. 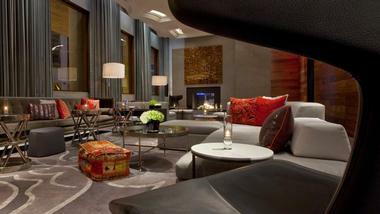 The half-circle sofa and chairs and ottomans are the perfect place for guests to unwind with their company. The suite is laid with white oak flooring and also comes with a dining table suitable for up to seven guests. The master bedroom has a master bathroom as well which features an oversized walk-in shower. This suite will leave guests extremely “wowed”. Trace is the on-site eatery which serves up Central Texas style cuisine with a conscious mind for the sustainability and staying local. All foods are sourced from local farms and vendors, bringing the ultimate in freshness to every meal. Guests can enjoy breakfast, lunch and dinner at Trace with menu items sure to please any palate. Breakfast hours are from 6:30 to 11 a.m. Monday to Friday and 7:30 to 10:30 Saturdays and Sundays. Lunch is served Monday to Friday 11:30 to 2 p.m. Monday to Friday and brunch on Saturdays and Sundays from 11 a.m. to 3 p.m. Dinner is a casually sophisticated experience in the cozy, contemporary space of Trace and is available Monday to Thursday from 5:30 to 10 p.m. and Friday to Sunday 5:30 to 11 p.m. Guests wishing to enjoy a meal on the go can use the W2GO service where hearty, delicious menu selections can be prepared and boxed up to take along for a full day’s adventure out and about. Any guests wishing to dine in the comfort and privacy of their room or suite, need only to pick up their in-room phone and order from a fine selection on the in-room dining menu. The Living Room is the stylish, sleek place to be when guests are looking for a meeting and mingling place to enjoy farm to bar colorful cocktails. The Living Room consists of four spaces, all with their own vibe and ambience. There is a plush seating area with comfy couches and chairs, a fireplace room with a grand fireplace and cozy vibe, a secret bar area with amazing acoustics, and even a screened in porch area with tall ceilings and a view of the starry night sky. There is usually a DJ playing a mix of music to enjoy while sipping a cocktail and meeting new people. It is a hipster atmosphere with a casual, laid back feel. If guests wish to have a little snack while visiting The Living Room, they can order from the Small Plates menu for some delicious lighter fare. The Wet Bar is open seasonally and is found poolside. The ambient lighting, plush seating and umbrellas offer a beachfront feel right in the heart of Austin. Guests can enjoy all-natural cocktails, which are made with local organic spirits, beers and wines. Guests can order at the walk-up bar or just lounge peacefully poolside and wait staff will serve drinks right to them. There are healthy snacks available to munch on throughout the day as well. The Wet Bar is open March to November from 11 a.m. to sunset and food service from 11 a.m. to 5 p.m. 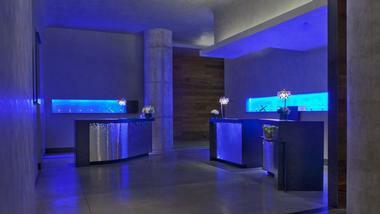 The AWAY Spa at W Austin Hotel is designed with artistic, contemporary calming comfort in mind. The cool blue tones and unique lighting add to the overall soothing vibe and promise to whisk guests away for an experience they will not forget. There are seven treatment rooms where guests can enjoy essential oil treatments, massage therapies, body scrubs or wraps and many other rejuvenating and refreshing options. The nail lounge offers manicure and pedicure services at little stations and a 52” television to enjoy while being pampered. Each treatment room and mani-pedi station comes equipped with an IPod docking station so guests can unwind to the sounds of their own playlist or opt for one created by the spa. They are open from 9 a.m. to 9 p.m. daily and it is recommended to make reservations ahead of time. Located only about two miles away is the Lion’s Municipal Golf Course offering 18 holes of golf over 6000 yards. It is open to everyone wishing to enjoy a round of golf. The course has been open since 1934 and has been a long-time favorite with both locals and visitors alike. There are varying tees to accommodate different levels of skill as well. Tee times may be booked online or by telephone in order to ensure availability. There is also a driving range and putting green on-site for guests to practice their skill. Also close to W Austin Hotel is historic Riverside Golf Course where legends Tom Kite and Brad Crenshaw perfected their games. It is lined with robust oak trees, maples and pecans. There are three tees to choose from depending on skill level. Guests will also enjoy the Tin Cup Grill for a bite to eat before or after their golf game. Guests can book a tee time but it is not necessary since walk-ups are welcome. All couples who decide to hold their special day at the W Austin Hotel will receive the Whatever/Whenever Service specific to the W chain. This service means couples will have the wedding they have always envisioned with a stylish backdrop as well. The hotel will assist in planning every detail from pre-wedding activities to the day after. Menus can be customized to suit the exact tastes and preferences of each bride and groom. Guests of the wedding will receive special overnight rates when booking their room at the hotel. There are several venues for couples to choose from at the hotel to host their ideal wedding day. At the end of the night, the couple will receive a bottle of bubbly in-room to celebrate their commitment. Meetings are always welcome at the W Austin Hotel, with seven meeting venues to meet the needs of groups of various sizes. W Austin is pleased to provide sustainable meetings, meaning the utmost importance to the environment is given when providing meeting services, from providing recycling facilities to meeting goers to providing recycled paper and using LED white boards when possible instead of chart paper. Even sustainable food sources are incorporated into the food menu for meetings. The W Austin Hotel is very pleased to be an eco-friendly establishment, incorporating sustainable, eco-friendly practices wherever possible. All rooms have in-room recycling to keep garbage at a low. In every room, guests will find Bricor Vac.Flow Venturi showers which output strong stream but yet only use a low flow of water. The hotel strives to reduce their carbon footprint as much as possible by using high efficiency lighting, dual flush toilets, composting organic materials and monitoring the recycling program throughout the guest’s rooms. Trace, the on-site restaurant, works hard to source local, sustainable foods for the menu as well.